Younger Americans used libraries and bookmobiles in the past 12 months at slightly higher rates than older Americans. They were significantly more likely than older adults to have used a library website. They are also more likely to have ever used a library in the past. Overall, the percentage of all Americans who visited a library in person in the previous year fell from our 2012 to 2013 surveys, but the percentage who used a library website increased. Few library users made use of a library website without also visiting a library in person in that time, however, so overall library usage rates did not increase. 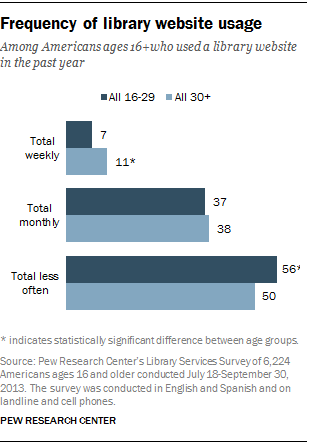 Among younger Americans ages 16-29, the proportion who visited a public library in person in the previous year dropped from 58% in November 2012 to 50% in September 2013; among older adults, the percentage dropped from 52% to 47%. Among younger age groups, the largest drop was among college-aged adults, as the percentage of 18-24 year-olds who visited a library fell from 56% in 2012 to 46% in 2013. The proportion of younger Americans who used a library website in the previous year grew from 28% in 2012 to 36% in 2013, with the largest growth occurring among 16-17 year-olds (from 23% to 35%). The proportion of older adults (ages 30 and older) who used a library website in the previous year also grew, from 24% to 28%. Looking at differences among younger age groups, we find that older teens ages 16-17 are more likely than those ages 18-24 to have visited a library in the past year, though 18-24 year-olds are more likely than any other age group to have ever used a library website (though not within the past year). However, among those who have visited a library in the past year, there are few differences in frequency of visits by age. Finally, while younger Americans are more likely to have ever used a library website, or even to have used one within the past year, older library website users’ visits are somewhat more frequent: 11% of recent library users ages 30 and older say they use the website at least weekly, compared with 7% of those under 30. Among those who have ever used a public library, most patrons across all age groups say their library use has stayed about the same over the past five years. Older patrons (particularly those ages 30-49) are more likely than other groups to say their library use has increased in that time, while younger patrons (particularly those ages 16-24) are more likely to say their library use has decreased. As with the general population, most Millennials know where their local library is, but many are unfamiliar with all the services they offer. However, most younger Americans feel they can easily navigate their local library, and few say they would have difficulty visiting their library or using its website. The vast majority would describe libraries as warm, welcoming places, but younger patrons are less likely to rate libraries’ physical conditions highly: Though 70% of older patrons say they would describe their local library as a “nice, pleasant space to be,” only 59% of younger patrons say this. Some 11% of younger patrons say they have had a negative experience at a library. As in previous studies, the very youngest and oldest age groups of patrons tend to know the least about services offered by their local library. 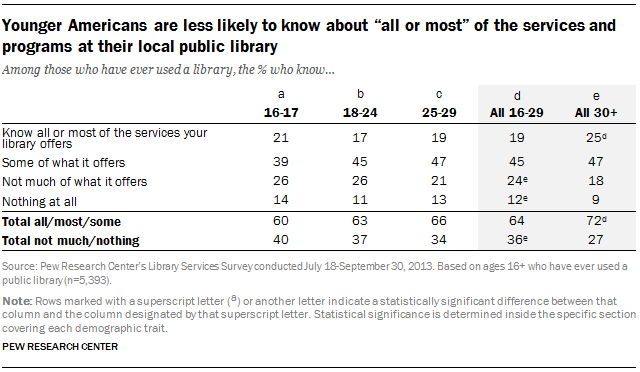 Among patrons under age 30, some 19% say they know about “all or most” of the services offered by their local library, 45% say they know “some” of what is offered, and 24% know “not much.” An additional 12% say they know “nothing at all” about their local library’s offerings. These proportions are similar to what they were in 2012. 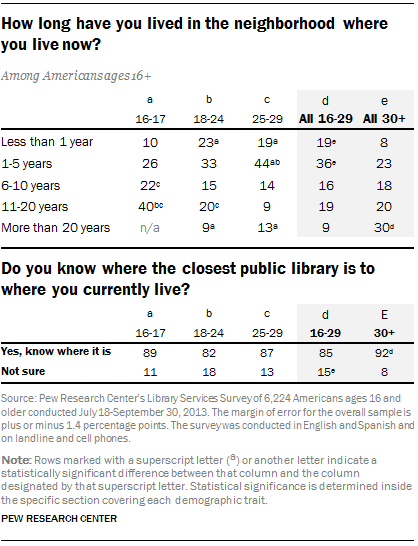 In additional questions about the ease of finding and using their local library or its website, younger patrons were just as likely as older patrons to say they find it easy or very easy to visit a public library in person (94% vs. 93%), and are more likely to say it is easy or very easy to use the website of their library (90% vs. 79%). Among those who have ever visited a library, 93% of patrons under 30 say it is easy to find what they’re looking for when they visit their local library, and 94% say that public libraries are welcoming, friendly places—rates almost identical to those of older patrons. However, though most younger library users say they would describe their local library as a “nice, pleasant space to be,” they are less likely to do so than older patrons (59% vs. 70%). When those who have ever used a public library were asked specifically about negative experiences at libraries, patrons under age 30 were more likely to say they have ever had a negative experience at a library (11%) than older patrons (8%), though most said they had not. 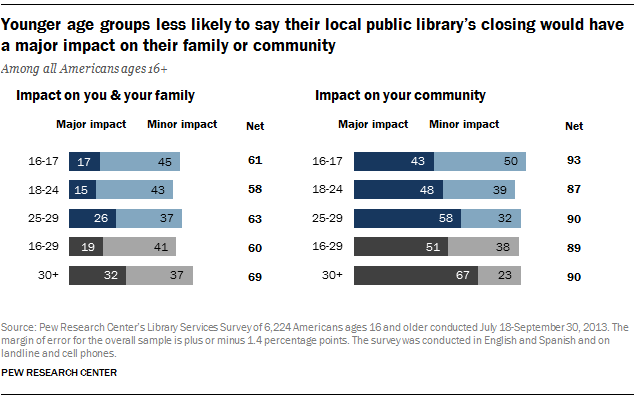 As in previous years, younger Americans—particularly those under age 25—are less likely than older adults to say that if their local public library closed it would have a major impact on either them and their family or on their community, though they are generally as likely to say it would have an impact on their community overall. Some 19% of those under 30 say their library’s closing would have a major impact on them and their family, compared with 32% of older adults, and 51% of younger Americans say it would have a major impact on their community, compared with 67% of those 30 and older. In our surveys, we asked younger Americans about how they use public libraries, both in-person and online, and which services they would like to see libraries offer if they do not already do so. In our library engagement survey in 2013, however, we focused on how Americans rated the importance of various library services to themselves and to their families. 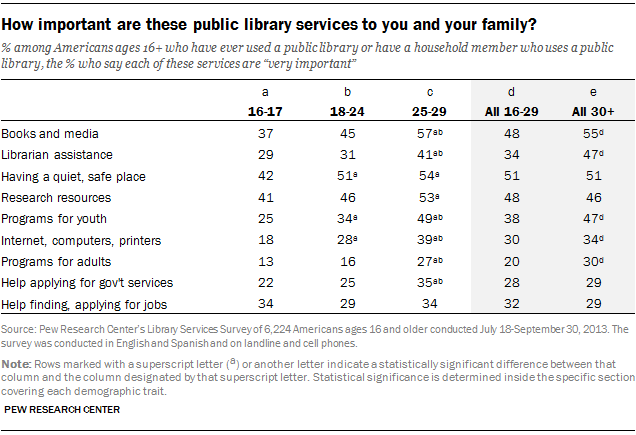 Among those with library experience—that is, those who have ever used a public library, or who have a household member who uses a public library—patrons ages 16-29 are significantly less likely than those ages 30 and older to say that several services are “very important” to them and their family, including books and media (48% vs 55%), librarian assistance (34% vs 47%), programs for youth (38% vs 47%), internet and computers (30 vs 34%), and programs for adults (20% vs 30%). At the same time, however, responses among older adults are not identical. It is important to note that adults in their 30s and 40s are most likely to value many library services, while the very youngest and oldest age groups are least likely to highly value these services. 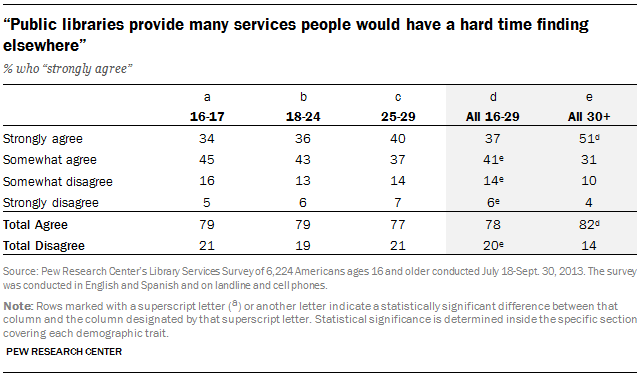 In fact, those 65 and older are most likely to say that none of these library services are very important to them, and rate most services as less important overall. Even among younger patrons, we found statistically significant differences in response to almost all of the services we asked about, with the exception of library assistance in finding or applying for jobs. Young adults in their late twenties are more likely than younger age groups, particularly 16-17 year olds, to strongly value most of the services we asked about. 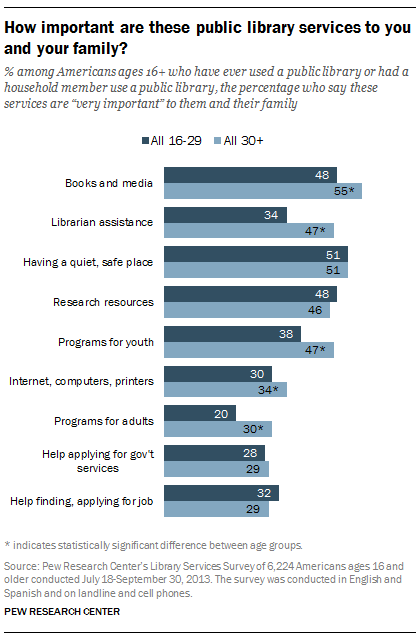 Some of the biggest gaps among patrons under 30 were using the library for books and media (37% of those ages 16-17 ranked this as “very important,” compared with 57% of those ages 25-29), programs for youth (25% vs 49%), using the library’s internet, computers, or printers (18% vs 39%), programs for adults (13% vs 27%), and help applying for government services (22% vs 35%). 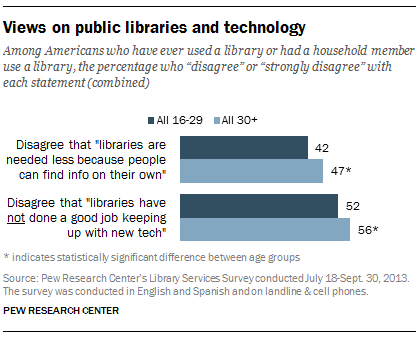 Public libraries have not done a good job keeping up with new technologies (52% vs. 56%). 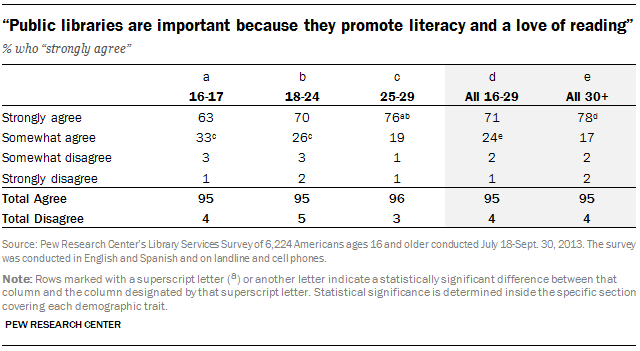 Overall, the youngest age groups are least likely to strongly value public libraries for literacy promotion efforts: Just 63% of older teens ages 16-17 say they “strongly agree” that libraries are important for this reason, as well as 70% of those ages 18-24, compared with 76% of adults in their late twenties. Younger age groups were not more likely to disagree with this statement, however, and were as likely as other age groups to agree with it overall. 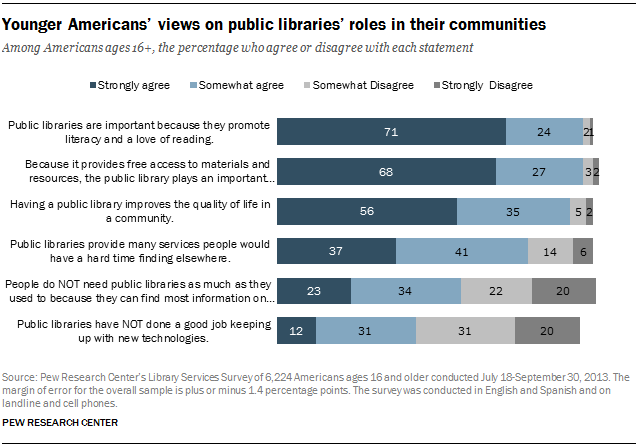 There are few differences among older age groups when it comes to this view, with 78% of adults ages 30 and older strongly agreeing that this is an important role for libraries. 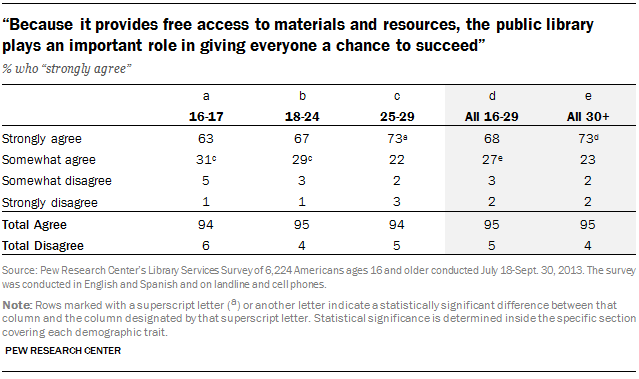 Young adults in their late twenties (73%) are also more likely than 16-17 year-old (63%) and college-aged (67%) respondents to strongly agree that public libraries play an important role in giving everyone a chance to succeed by providing free access to materials and resources. Younger age groups were more likely to simply “agree” with this statement, though they were not more likely to disagree. 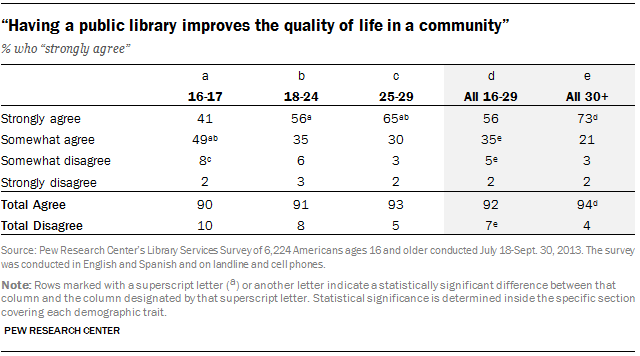 The belief that a community’s quality of life is improved by the presence of a public library correlates strongly with age: Adults ages 30 (73%) and older are more likely to strongly agree with this statement than those in their late twenties (65%), who are more likely to strongly agree than those ages 18-24 (56%); the youngest age group in our survey, those ages 16-17, were least likely to strongly agree with this statement (41%) than any other age group. Young adults under age 30 are slightly more likely to disagree with this statement overall than older adults (7% vs 4%). 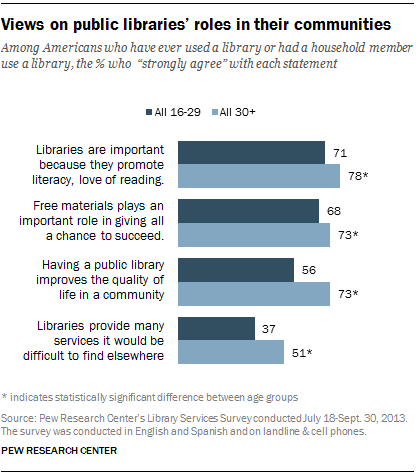 Overall, 78% of Americans under age 30 agree that public libraries provide many services people would have a hard time finding elsewhere, including 37% who strongly agree. Adults ages 50 and older are actually most likely to strongly back this statement, with 54% of those 50-64 and 56% of those 65 and older strongly agreeing. 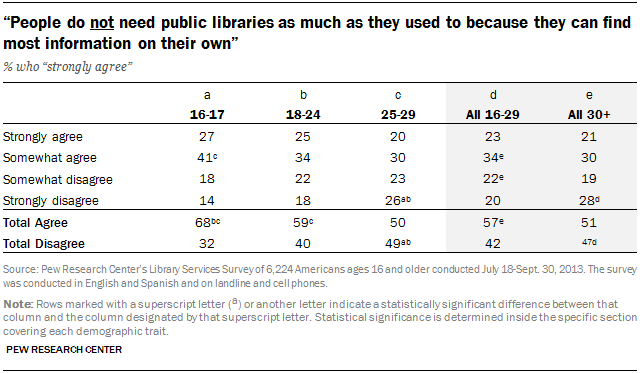 Younger adults are somewhat more likely than older age groups to feel that public libraries are not as necessary as they used to be because people can now find most information on their own. Among the younger age groups, 16-17 year-olds are most likely to feel that libraries are not as necessary these days, while young adults in their late twenties are most likely to disagree. 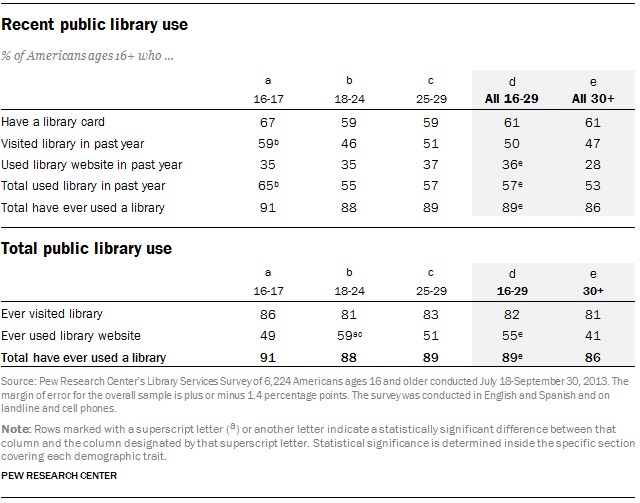 However, though this belief tracks with age to some extent, there are differences as well among older age groups: Adults ages 65 and older (25%) are actually more likely to strongly agree that people do not need libraries for information as much than those ages 30-64.